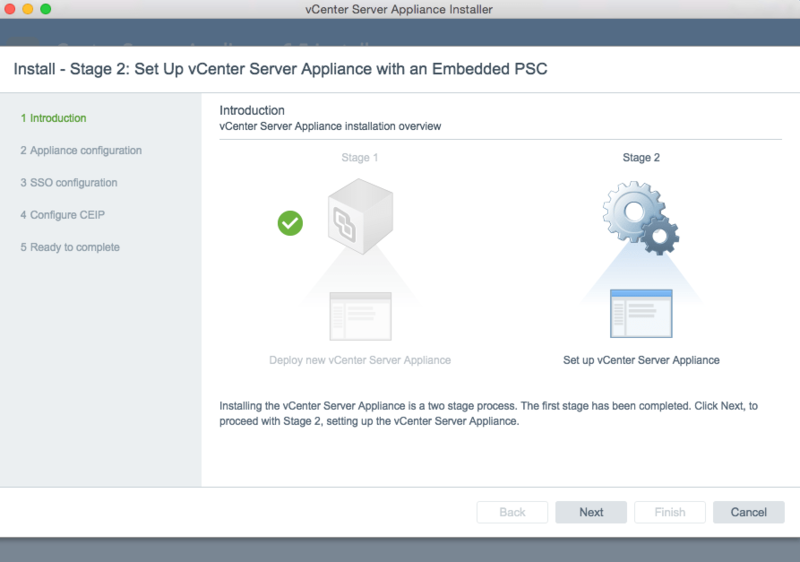 You are here: Home / Fusion / How to deploy the vCenter Server Appliance (VCSA) 6.5 running on VMware Fusion & Workstation? As with any new release of vSphere, it is quite common for customers to deploy the new software in either a vSphere home or test lab to get more familiar with it. Although not everyone has access to a vSphere lab environment, the next best thing is to leverage either VMware Fusion or Workstation. With the upcoming release of vSphere 6.5, this is no different. In fact, during the vSphere Beta program, this was something that was asked about by several customers and something I had helped document as the process has changed from previous releases of the VCSA. In vSphere 6.5, the VCSA deployment has changed from a "Single" monolithic stage where a user enters all of their information up front and the installer goes and deploys the VCSA OVA and then applies the configurations. If you had fat finger say a DNS entry or wanted to change the IP Address before applying the actual application configurations, it would not be possible and you would have to re-deploy which was not an ideal user experience. Just like in prior releases of the VCSA, the UI translates the user input into specific OVF properties which are then passed into the VCSA guest for configuration. This means that if you wish to deploy VCSA 6.5 running Fusion or Workstation, you will have two options to select from. You either deploy VCSA and complete both Stage 1 and 2 or just Stage 1 only. 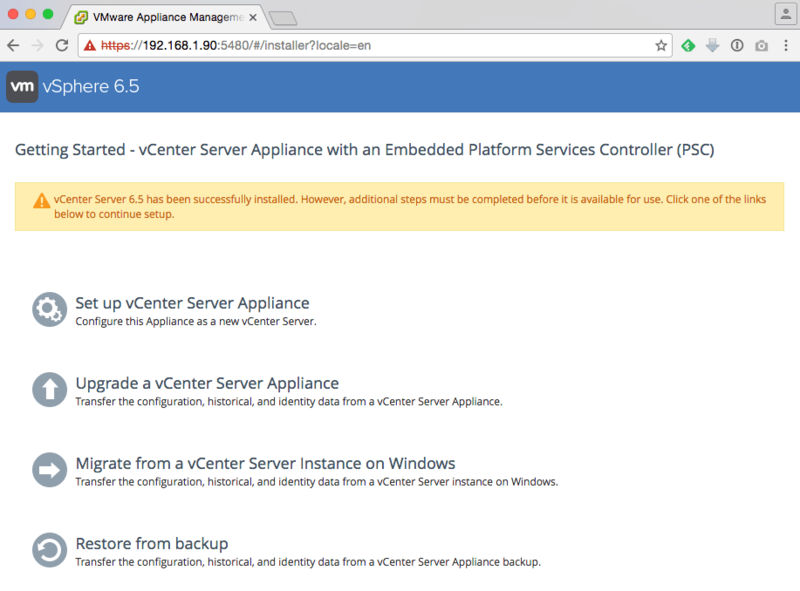 If you select the latter option, to complete the actual deployment, you will need to open a web browser to the VAMI UI (https://[VCSA-IP]:5480) and finish configuring the VCSA using the "Setup vCenter Server Appliance" option as shown in the screenshot below. If your goal is to quickly get the VCSA 6.5 up and running, then going with Option 1 (Stage 1 & 2 Config) is the way to go. If your goal is to learn about the new VCSA UI Installer, then you can at least get a taste of that by going with Option 2 (Stage 1 Config) and this way you can step through Stage 2 using the native UI installer. One last thing I would like to mention is that there have been a number of new services added to the VCSA 6.5. One example is that vSphere Update Manager (VUM) is now embedded in the VCSA and it is also enabled by default. With these new services, the tiniest deployment size is going to require 10GB of memory where as before it was 8GB. This is something to be aware of and ensure that you have adequate resources before attempting to deploy the VCSA or else you may see some unexpected failures while the system is being configured. Note: If you have access to fast SSDs and would like to overcommit memory in Fusion or Workstation, you might be able to get this to work leveraging some tricks mentioned here. This is not something I have personally tested, so YMMV. 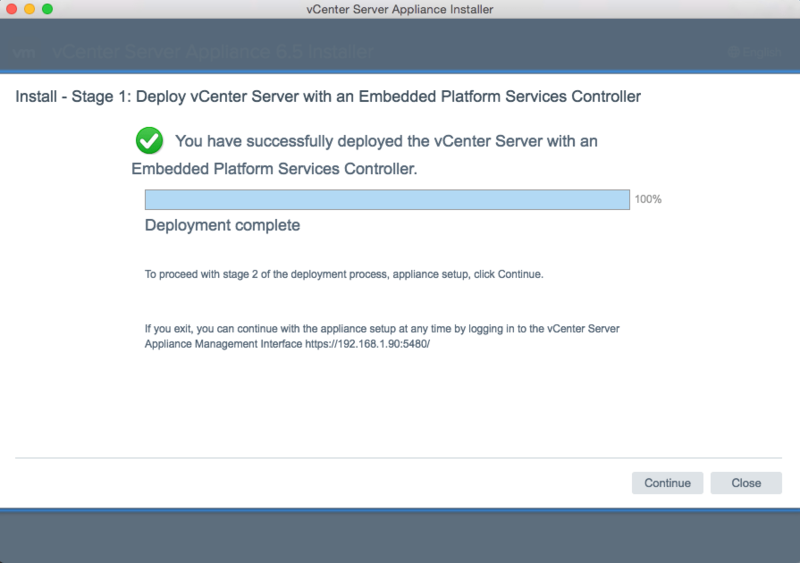 Step 0 (Optional) - Familiarize yourself with setting up VCSA 6.0 was on Fusion/Workstation with this blog post which will be helpful for additional context. Step 5 - Once you have saved your changes, go ahead and power on the VCSA. At this point, the guestinfo properties that you just added will be read in by VMware Tools as the VCSA is booting up and the configuration will begin. Depending on the speed of your hardware, this can potentially take up to 15min+ as I have seen it. Please be patient with the process. If you wish to check the progress of the deployment, you can open a browser to https://[VC-IP]:5480 and you should see some progress or you can periodically connect to the Hostname/IP Address and once it is done, you should be taken to the vCenter Server's main landing page. where can we download this for testing? You use File | Import to import the OVA, not Open, right? Also, I copied and pasted your lines and was able to get it working, then changed the IP addresses in the VCSA. However, if I edited the lines in the VMX file after copying them to change the IP addresses to mine (10.x) it kept saying Dictionary Error or that the VMX file is corrupt. Any idea why that may be? Jason, I had the same problems with “Dictionary Error” or “VMX file is corrupt”. I think it has to do with the characters used when copying and pasting from the website into TextEdit. I ended up editing the file using VI and hand typed everything in. That “mostly” worked, but I still had to set a root password and configure my NIC settings once the appliance came up. After that, and a restart of the management network, everything seems to be running. Fingers crossed that it actually works! Confirmed to work by using a plain text editor, or switching TextEdit to plain text mode. The other problem I had was due to the fact that I didn’t have my forward and reverse DNS entries set. Once I did that, I re-ran the deployment and it worked perfectly. Dictionary error happens when you copy paste into your file. I sorted this by changing my ( ” ), meaning my quote character. They where kind of strange in the text i pasted in. These instructions seem incomplete. The instructions assume things that aren’t exactly straight forward. From what I can see, and from VMWare’s information, there is no vCSA 6.5 OVA, only in ISO format. How do we get to Stage 1 in the article if there is no OVA. I figured it out. Apparently the download is in ISO format. Inside the ISO is an OVA, located in the vcsa folder. I’m hoping we can edit the memory allocation for this as previous versions… I’m always of an appliance over a windows based install, but 10gb memory allocation on a home lab setup is a big ask, especially when I am running 6.5 from a 2008 server install with 3gb quite happily. anyone know of any ways to knock the memory allocations down again? is it similar to the 6.0 ways (java heap etc)? hey bro, did you find some way to install ESXI 6.5 in hom lab with less than 10 gb of ram? i know i can install it in one of the host but i am really stubborn and i want it in my laptop (8gb ram). i actually did it, just open powershell in administrator mode (i don’t know if is mandatory) then just navigate to F:\vCenter-Server and run the .exe followed by “SKIP HARDWARE CHECKS=1” , the quotation marks are obligatory , its all, of curse i tried with 6gb and get an error because of lacks of ram, later i tried with 8 gb and it installed without problem. i dont know if my error was an isolated situation and you can actually install it with less than 8 gb of ram. If I Press ALT – F1 I see the following line on the command – Photon-machine login: setterm: $TERM is not defined. I have two other ESXI hosts in the subnet than can ping and reverse lookup the DNS record for the vCenter appliances that I have created. I have also made the settings with text editor. As I said before it’s just stopped working. I have also this problem but when i increased the memory of esxi then it resolved. @Evan, I had the same issue, and tried a lot of times, mittalrohan@hotmail.com is correct, increase memory can resolve the issue. More precisely, the “Tiny” configuration (2 vCPU 10GB RAM) does not enough for VCSA to configure itself correctly! I increase memory to 12GB, 14GB each time but encounter different issues respectively. After I choose “Small” configuration (4 vCPU 16 GB RAM) then the VCSA finally deployed successfully. One additional reminder is DNS. VCSA v6.5 is *VERY* strict in DNS *AND* reverse DNS lookup compared to previous version. You must verify that you have correct DNS setting before proceeding with “Small” configuration. Actually i found another way to make it work, there is no need to change anything in .vmx file and you just import the ova file, after that power-on the machine, after the vmware splash image press “e” . in the boot menu find the line that starts with “linux” enter this “rw init=/bin/bash” at end of the line and press F10. let machine boot and you will see “[email protected]~~~#”, after that type “passwd” press enter and type the new root password. then type “umount /” hit enter. Let the machine reboot and boot, after that in the main page of the of the vcenter appliance press f2 and set you network config. What gave Soheil works perfectly without the need of increasing memory etc. You just need to append rw init=/bin/bash at the end of the linux entry and press CTRL-X to let it reboot, then change the password. Thanks to Soheil, I eventually got my VCSA VM installed as well. However, ‘Getting Started’ isn’t working out yet. VCSA has forward/reverse DNS records. I browse to the VCSA, go through five setup menus, and then it hangs at ‘Waiting for RPM Installation to finish (% done. )’ Eventually, it returns to “unable to invoke installation due to vcsa is not ready check if rpm installation is completed”. My host is 8GB RAM; actual resource consumption is pretty low (2/8GB RAM in use). Many thanks for all good suggestions. I’m in the same spot… Using Workstation 12. I can get the Appliance booted, I just enter / update the password while it’s at the shell prompt during boot and then update the network configuration using F2 once the DCUI interface it up. At that point I can browse to it on the network… however, it just sits at “Waiting for RPM Installation to finish (0% done)” or even 90% done… but never get’s past. I am stuck here too… any idea how to resolve? I gave up on having vSphere in my lab for now. Just using two separate ESXi hosts with 8GB RAM each until I luck out with a spare PC with more RAM. Do these options no longer work with VC 6.7? I tried using these options and see that the IP gets setup properly, but VC never gets configured. Couldn’t get it work adding the values directly to the vmx, so just added the OVF xml via guestinfo.ovfEnv. Thanks! Do you have a blog on installing an external PSC 6.7 first and then VCSA 6.7 please? I meant to add installing PSC 6.7 on Workstation and then vCSA 6.7?